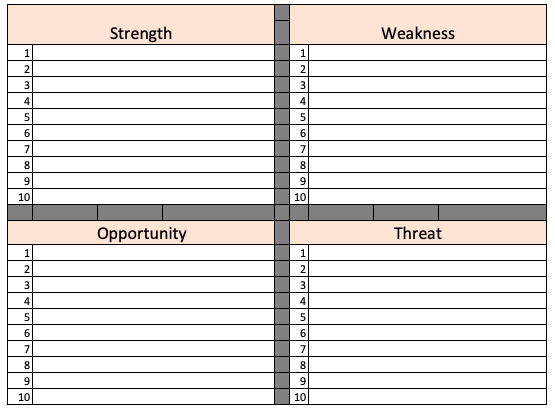 If you’re looking for a simple, yet robust tool to help in to help you develop your business strategy, or your improvement projects, the SWOT tool (which stands for Strengths, Weaknesses, Opportunities, and Threats.) is a simple but effective tool that can help you prioritize internal and external influences and help you in defining a strategy and appropriate action list. In this article we’ll take you through the SWOT analysis tool and provide a few SWOT examples for you to take a look at for inspiration! The tool is structured by looking at internal factors (Strengths & Weaknesses) and external factors (Opportunities and threats). The internal aspects are those that you have some influence over and can possibly change while you are unable to influence External aspects. 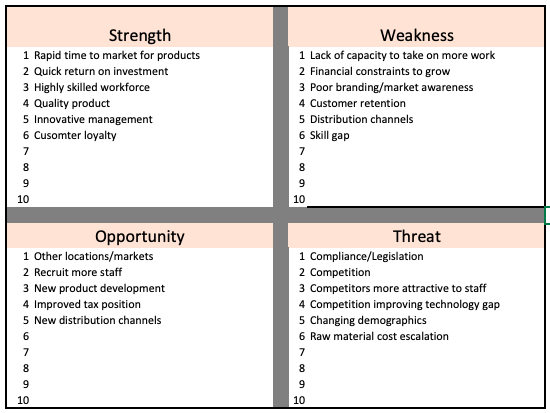 The SWOT isn’t a complex tool, you simply take your proposed inputs, prioritize them and add them to the tool. The tool itself is a simple 4 box grid that lists each segment. Once you’ve completed the SWOT you create an action list built on the input. 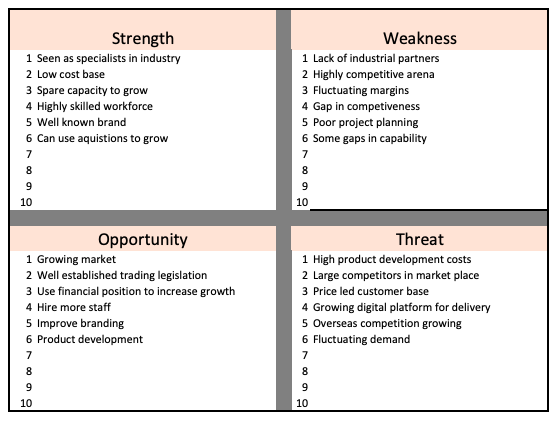 While SWOT’s are typically used in business strategy creation they are a neat little tool that can also be used in other circumstances such as projects & continuous improvement. In using the SWOT analysis tool, you’ll be armed with a “to-do” list for prioritizing the work that you need to do to grow your business. 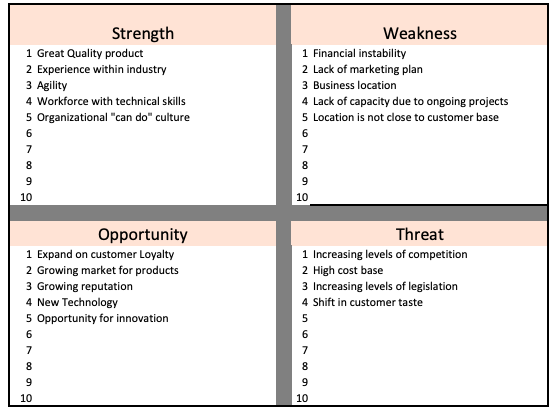 Here’s a simple example of a typical SWOT. While it’s a simple tool it is still powerful. The SWOT analysis forces you to analyze the key influencers around your subject matter (be it business strategy or other). Given that the SWOT is created in a team environment it’s often done so with a fresh set of eyes which can lead to new ideas and thoughts. When you’re looking to do a SWOT analysis, your team should be a mix of leadership + and appropriate staff members who have a level of familiarity with the subject matter. Having a team built up with individuals with varying viewpoints can help tremendously and help prevent an unbiased view. Depending on your subject matter, ensure you choose people to contribute who can express different slants and perspectives. For example, the obvious opportunity here is to chose the make up of your team from different functional groups, e.g you might choose participants from Sales, Engineering, Supply Chain or Quality for example (ideally choose participants from throughout the lifecycle of the subject under scrutiny or those who have direct access to the customer.) Fundamentally, the more diverse and experienced the participating group the better likely the outcome. Look for people who are likely to have diverse opinions and comfortable with participating. The more diverse your participating group the better (more views count), however, if you’re limited into who you can invite you can always consider those immediate to the subject being reviewed (or even close friends and business acquaintances if you’re really limited). Also remember that SWOTS are great as a tool to review your current position but always remember that you should dust them off and review them periodically (perhaps every, 6-12 months). Businesses change and just because the inputs into a SWOT tool were what they were 6 months ago they are unlikely to stay static. 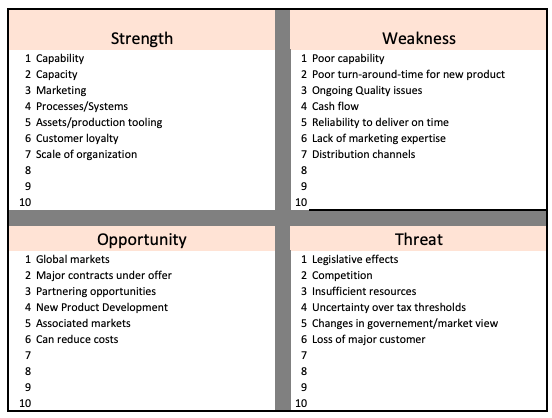 What is the best way to do a SWOT analysis? Set aside the right amount of time to complete it (don’t look to rush it). Get everyone to generate ideas – Ideally you’ll want to avoid individuals overpowering others (with ideas) – so you can start off with people with pads of paper and generate their own list before feeding it into the team for review. Make sure everyone understands everyone’s inputs are valued and equal. Once everyone has created their own ideas, put them all up for review. Group similar (or the same) ideas together and don’t forget to capture anything that crops up during the discussion at this stage (this part of the process can often be an excellent ideas generator). Once all the ideas have been organized, rank them. There is a multitude of ways of doing this. One method I favor is to allow everyone a vote and allow people to rank the ideas generated. You can then add up everyone’s votes and prioritize the lists. Once the list is prioritized, have a healthy chat about how the lists now look. Allow for some movement (it’s best if you nominate someone as chairperson who’s final vote counts – just in case there are arguments!). Once you’ve generated the SWOT look to see how you can build a corresponding action list that supports what you have created. Brainstorming doesn’t have to be scary! One of the most daunting steps of the process is the brainstorming element. Whilst it might not seem obvious at first, people can “dry” up and it’s a good idea to go into the session with a few methods to spark conversation. One such method is by asking questions to start the analysis. Ok, this is the bad stuff, These are typically the areas that you will look to improve to enhance your competitiveness. Weaknesses typically detract from your strengths. In many occasions, you can read across from your strengths and many of these can also be weaknesses. For example, consider your resources, their knowledge and skills can be a great asset but what happens if you don’t have enough? This can lead to a capacity shortfall and hurt your capability.regulatory change. So there are some things that you can think about when you’re creating your SWOT. Now let’s take a look at a few examples. We’ve listed a few to give you an idea of how a SWOT might look to give you some thoughts of how you can construct your own. So you’ve created your SWOT, what next? Remember that the SWOT tool is just that. Once you’ve completed it you should be looking to build an action plan around it. You should be looking at your strengths to improve your business and then look at threats and how you can mitigate them. One thing you can do is build Goals that you can then set out to achieve (monitored by numbers/data of course), you can then schedule them and monitor your success in achieving them (i.e. you might choose to implement a mitigation strategy for a key risk within the next 6 months). Remember also that the SWOT tool is not set in stone and you should review it regularly to keep abreast of your market + the actions you’ve taken previously. As ever if you’ve got some ideas or comments on how you can use the SWOT tool, we’d love you to feedback in our comments section below or hit us up on Twitter.